Huge volcanic activity over three billion years ago appears to have altered the tilt of the Moon, according to new research. 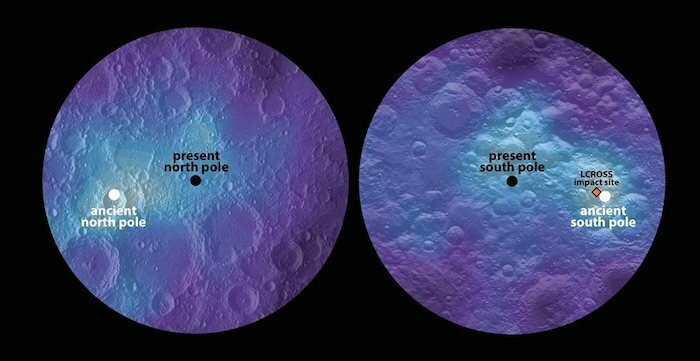 Scientists concluded that the celestial body may have once spun on a different axis after studying its north and south poles, and finding that lunar ice was deposited in unexpected locations. 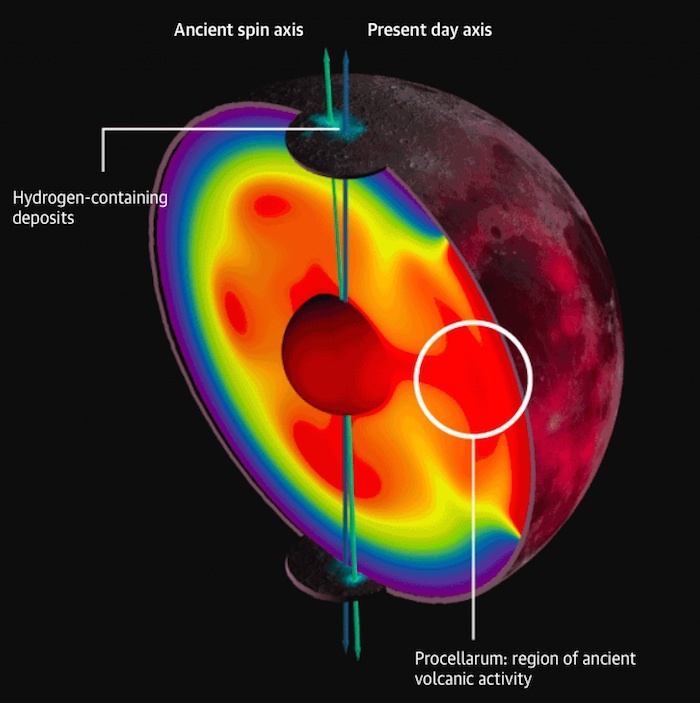 The researchers concluded that the moon’s axis of rotation is now 5.5 degrees different from what it once was as a result of volcanic activity, which stemmed from a region of hot rock lurking deep beneath its surface. Orbiting the Earth at an average distance of 385,000km, the moon boasts some of the coldest spots in the solar system, with temperatures at its poles reaching below -240 C.
The revelation came after a US and Japanese research team took a fresh look at data collected by the Lunar Prospector neutron spectrometer in the late 1990s. Such data had previously been used to map the presence of hydrogen deposits on the lunar surface and, because water is rich in hydrogen, had led scientists to conclude that they were made of ice. But scientists had been puzzled by that fact that deposits of hydrogen didn’t tally with what would be expected from current lunar temperatures. The latest research suggests two of these deposits are not only offset from the moon’s current axis by around 5.5degrees each, but are diametrically opposite to each other. That, the authors of the new study conclude, suggests that these deposits mark “palaeopoles” - former north and south poles where ice formed billions of years ago. This change in lunar tilt, the researchers suggest, could have been triggered by change in volcanic activity more than 3.5 billion years ago - a period when a region on the near-side of the moon known as the PKT erupted with the lava flows that formed the large, dark expanses of basalt visible from Earth. As the mantle deep within the moon heated up, it expanded and decreased in density. According to models created by the authors of the new study, that could have been enough to change the moon’s tilt. “It is like taking a football and removing a chunk out of one side - that would change how the football would spin in the air,” said Keane. 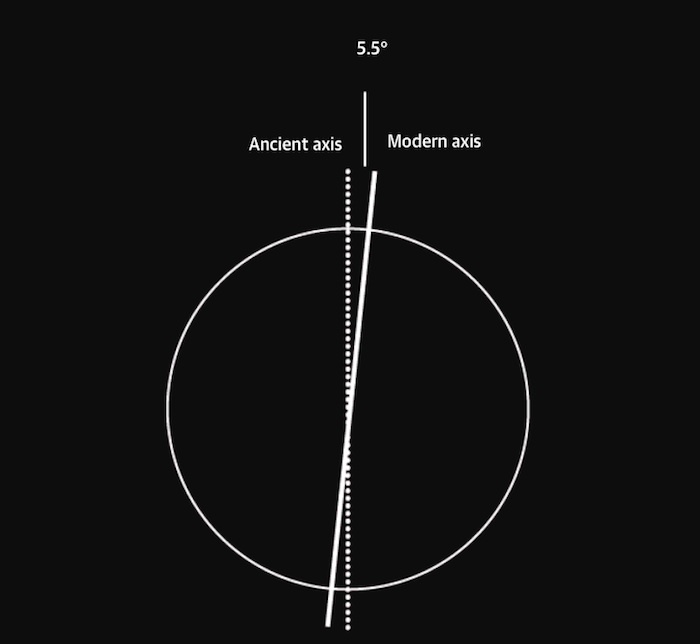 Another puzzle lies in the fact that the scientists found two distinct palaeopoles, rather than a continuous path that might have been expected from a gradual change in the tilt of the moon. Professor Ian Crawford, a planetary scientist from Birkbeck University, said the study was “persuasive”. But he believes that to confirm the theory scientists should embark on developing a new series of instruments to probe the surface of the moon. “I think there is a very strong place for soft landing one or more spacecraft in these localities and drilling to depths of a few metres to confirm the presence of subsurface ice,” he said, adding that understanding ice deposits on the moon could prove a valuable resource in future space explorations. Keane also believes the palaeopoles could yield further insights. “It might be a primordial sample of water ice, which we don’t have on the Earth,” he said. That, he believes could offer scientists a chance to crack an abiding conundrum: where the Earth’s water came from. “This might be a place right in our backyard where we could go and sample that water and try to answer those questions,” he said.